Welcome to Orlando Custom Concrete Pros! This type of concrete has been processed through a series of mechanically ground steps, similar to the production of terrazzo. 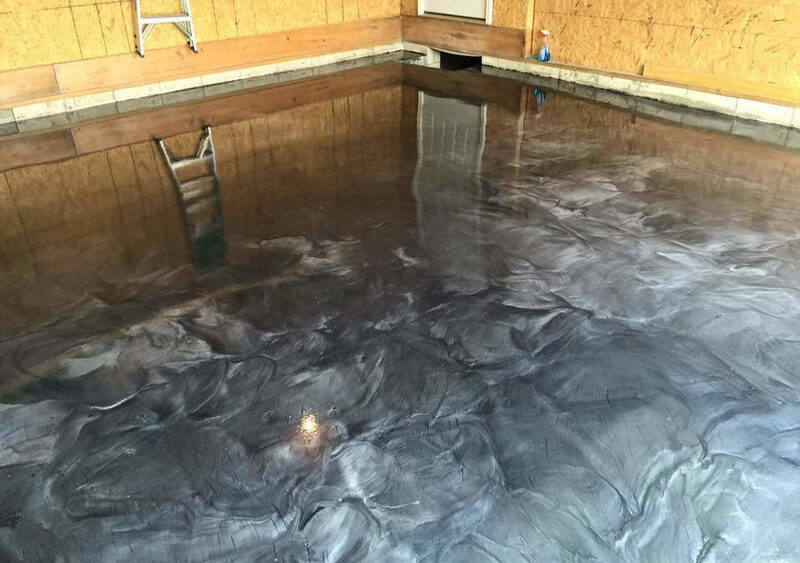 A chemical known as a hardener is added to the regular concrete, creating a chemical reaction to help in hardening and dust proof the surface. We recommend polished concrete for flooring if you are looking for more chic, sophistication and for that modern design look. If you are looking to improve the look on you patio or porch to have that lustrous sheen, we highly recommend this type of concrete. This concrete is created with the intentions of having tonal differences such as subtle cracks and aggregates to give a stone like, natural feel. One can also use stained concrete on countertops or any other indoor surfaces. This concrete is for anyone who is looking to keep their concrete floors looking at their best with low or minimum maintenance. In this case, existing concrete is cleaned and allowed to dry and then a thin layer of acrylic is spread on the concrete, applied in a similar fashion as paint. Once dry, the surface is shiny because there is a thin layer of acrylic plastic that has filled the voids of the existing concrete. As the name suggests, this concrete is patterned, textured or embossed to resemble features like bricks, slate, flagstone, tiles, wood or other various patterns and textures. Stamped concrete is most suitable for patios, sidewalks, driveways, pool decks and interior flooring. The ability of stamped concrete to resemble other building materials makes stamped concrete a less expensive alternative to using those other authentic materials such as stone, slate or brick. This type of concrete can be treated with stains or dyes to create a rich variety of colors and textures or stamped with patterns to mimic natural surfaces. Beauty and strength converge in decorative concrete. Like a good acid stain, they fuse together to create a durable, pleasing floor that literally becomes the foundation of its space and atmosphere. Achieving the desired result requires that you consider a number of variables for the specific stain and sealer combination you select. Home owners are now catching on to the appeal of more smooth shiny floors because they can be made to replicate the look of tile, slate and marble. It is important to note that excess moisture in decorative concrete is not good for this concrete because once it is absorbed by the concrete, it takes your design with it. A metallic epoxy floor coating is quite simply a low yellowing epoxy, with a metallic pigment mixed within. In other words, tiny, almost glitter-like pigments are mixed into an epoxy resin and then poured onto the floor or substrate. When these pigments become agitated with a paintbrush or roller, they gather, separate, twist and turn to reflect light at different angles. Eventually, the epoxy hardens and the metallic pigments are locked into place and give a three dimensional, swirly look. Epoxies create that gloss glossy seamless finish that can make the living space of a home look very impressive. The installation technique is what determines the final look of the floor and is a critical part in attaining the desired look. A concrete overlay is simply resurfacing old concrete with new concrete. A concrete overlay can give your ugly concrete patio, floor or pool deck a makeover. From a simple resurfacing to something quite decorative, the possibilities are amazing. The best thing about concrete overlay is that, it is of several types and you can choose to add colors or other decorations. It is important to be aware that not all existing concrete can be resurfaced. The underlying base for an overlay must be sound. If your concrete is heaving, has severe cracks, is spilling due to damage from deicing salts and freeze-thaw cycles, or resting on unstable soil, resurfacing will not solve your problems. If you think gray concrete is quite boring, we have a way of giving your existing concrete life by custom staining your floors to perfection. We have a vast number of options available to change up the entire appearance of your concrete to entice customers and impress your guests. We assist you in choosing what will work best for your application and needs including other specifics. Most people believe that they can acid stain concrete using the do-it-yourself (DIY) method which is very untrue. The biggest consideration to observe when you want to acid stain is the type of floor you are working with because the stain will not be covering anything, but rather reacting with the chemicals in the concrete. Sometimes people are prone to overdo the acid stain and at the end of it all, damage the desired results. We pride ourselves in having experts specifically trained and skilled in this area to make the perfect acid stained floors or surfaces in your home or property. We believe that concrete offers the highest quality finish to a modern space. It’s one of the most durable and beautiful surfaces one can have in your bathroom or kitchen spaces. We customize sinks and countertops to the perfect size and fit. Concrete countertops and sinks provide a unique and modern pallet for any design savvy homeowner. From ultra-modern to cozy country, concrete can achieve the natural look and feel you want for your new home or bathroom remodel. Summer is a season to have fun and entertain and that’s why we came up with concrete summer kitchens. We have specialized in custom making your summer kitchen to create the comfort feel in your own back yard. We have a variety of attractive designs to choose from to enhance your home and be the envy of your guests. Concrete conference tables are an unusual and at the same time a statement piece of office furniture. Whether you want to express professionalism and ethos of your business or you want to go industrial style, we use various techniques to custom make the concrete conference tables to your desired design. We also put into considerations the desired fittings that come with it such as access to cable points, telecommunication equipment and data points. Many people look at concrete driveways as being virtually maintenance free. Concrete is a favored material for most driveways because it is durable and requires minimal or low maintenance. Plain concrete driveways are pretty dull in appearance and we have come up with a variety of coloring and stamping options to pimp it up to a unique and attractive surface. If you are looking for an exquisite centerpiece for your out-door entertainment, then concrete fire pits is the way to go. Concrete fire pits are a great choice when looking for an elegant and durable outdoor fire feature. We offer a wide range of unique styles shapes and finishes that fit your backyard taste and preferences. Concrete retaining walls are built to provide lateral support to vertical slopes of soil that may have otherwise collapse to a more natural shape. Several factors have to be considered before putting up a concrete retaining wall for example, the location of the property, the landscape of the area and the weather conditions. We have a great team of experts who have the capabilities of recommending the type of concrete retaining wall to put up depending on the location of your home or property. Pool decks complete the ultimate outdoor entertaining experience, bringing the patio and pool areas together. The most amazing thing about concrete pool decks is that you can customize this concrete with colors or various decorations to compliment other areas of your home or property. We have created creative decorative ideas to blend your indoors and outdoors. A waterfall can make your swimming pool even more appealing. In addition, water in motion engages our senses, its beautiful to look at and thrilling to touch. Just like any other elements in your property, you want to choose water features that complement your home’s or property’s architectural and personal taste. We pride ourselves in constructing the best pool water falls much to our client’s satisfaction. Pool spillover bowls are outdoor features that can turn any landscape into a tranquil retreat. We construct spillover bowls that will stand the test of time and provide years of enjoyment in your home or commercial setting. We give our customers a variety of designs, colors and sizes to choose from and customize to meet any type of design specification or water line connection. Apart from offering these extensive services, we also offer repairing options for customers. We modify concrete surface areas such as drive ways, patios and pool decks, giving them a fresh new look. Our teams of professionals are fully committed to provide reliable concrete services and engaging the customers in the processes – from concrete delivery, setting up of project designs, the build up to the final product. We handle every aspect of construction, so you can continue living your life worry free. We have years of experience in the industry and are well accredited to take on even the complex projects.